Sometimes I just realise how much time I can spend to finish a pair of shoes – from the point the heels are bulided, “only” painting, waxing, sole painting, decoration etc. is left. One of my friend – makes only RTW dance shoes – can finish his products in minutes. I don’t mean it bad: dance shoes are not for elegant dresses, but dancing on a dusty stages, so fancy, shining heel is really not a demand. For me: this is the most challenging part of shoemaking: I always try to approach the PERFECT finish. And I never can.. some small stain on the sole (it will be dirty after the first step), etc, etc.. I could continue the small details. This is a relatively old customer: this is his 3rd pair in this year. 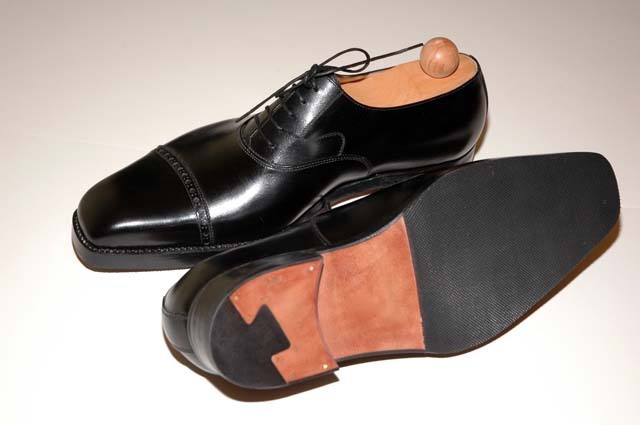 He knows very exactly what he needs: French boxcalf, double sole, English sewn on his bespoke last.